Cars pack the ferries taking people to and from the mainland to Port Aransas. Editor's Note: An earlier version of this story stated that the Rebuild Texas Fund reported the amount of recovery money Nueces County, where Port Aransas is located, has received. The reporting agency is called the Governor’s Commission to Rebuild Texas. City leaders say Hurricane Harvey damaged 100 percent of Port Aransas' businesses and 85 percent of the beach community's homes. Mayor Charles Bujan’s family has called the small island town home for more than 130 years. On Aug. 23 2017, he was being put to the test by the ocean he loved. He had been carefully watching what was, at the time, just a tropical disturbance in the Bay of Campeche. And he had a really bad feeling about what he saw. “As I watched it develop over time, I realized that there was no place it could come except right here in Port Aransas,” Bujan says. On Aug. 24, Bujan called for Port Aransas – which had a population of about 4,000 people -- to evacuate. Port Aransas’ City Manager Dave Parsons didn’t leave the island. He decided to ride out the storm at the University of Texas’ Marine Science Institute. “That was my one storm. So, I don’t think my wife would be too thrilled if I said I was staying for another one,” Parsons says. On the night of Aug. 25 2017, Hurricane Harvey made landfall near Port Aransas and neighboring Rockport as a Category 4 hurricane. Its winds were clocked at 130 mph. The storm caused millions of dollars in damage to the institute, but that would be just the beginning of the damage Parsons would witness in the days, weeks and months after Harvey. Mayor Bujan says the city's infrastructure alone – like the police station, the library and other city buildings – has incurred roughly $50 million to $70 million in damage. Many of those structures have yet to be fully repaired. 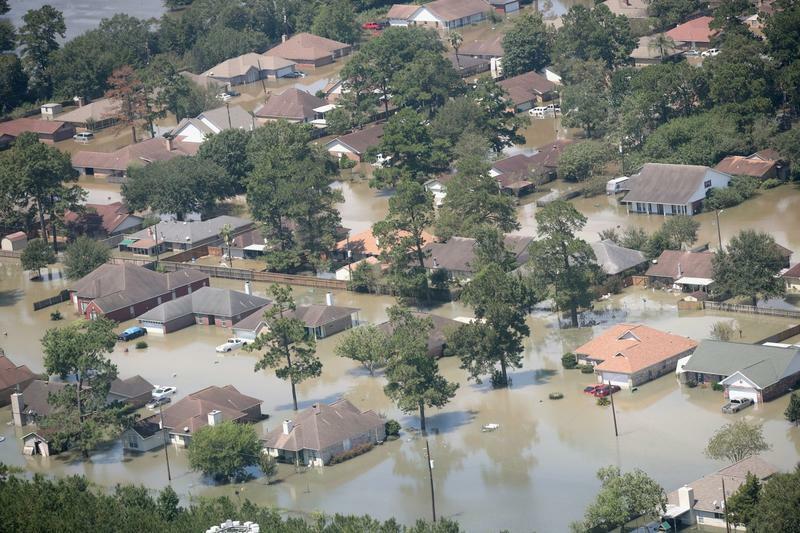 As for the city as a whole, Bujan estimates up to $1 billion in damage. 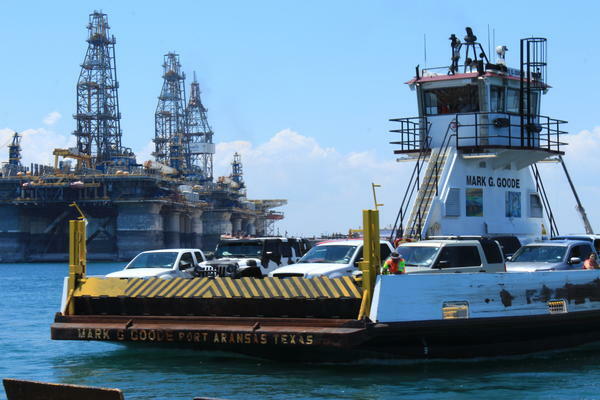 The Governor’s Commission to Rebuild Texas reports that as of late July, more than $170 million of state and federal money has been provided to residents of Nueces County, where Port Aransas is located. City leaders are banking on support from tourists to speed up their recovery process. And that’s where their rebuilding focus has been right now. “We’re adjusting those areas that are important to us in terms of our economy. We’re working on our harbor, our beach is in excellent, slick shape, we’re getting very good crowds,” Bujan says. On a sunny and hot day in early August, dozens of people line a Port Aransas beachhead; they’re laughing and having a great time - swimming, fishing, feeding seagulls and burying each other in the sand. Mike Montoya, of New Mexico, has traveled with his family to Port Aransas for several years. He says he loves the warm Gulf Coast waters – and the people. “This place is so laid back … and the people are super nice. Everybody gets along. That’s what keeps bringing us back,” Montoya says. Rhonda Wilhelm and her family have been coming from Austin to Port Aransas for 17 years to mark her sons' birthdays. “We come here every year for their birthday. We have twins … one’s out there fishing and one’s right here. We wanted to come and support Port Aransas," she says, "so, we were gonna come out regardless." A number of condos and rental homes in Port Aransas remain out of commission. But most of the shops and businesses in the town have reopened since the storm hit. Bujan thinks many of the visitors this summer have been day-trippers. But, for some Texans who call this area home, their relationship with the Gulf has changed. A packed ferry across the channel that separates Port Aransas from the mainland takes you to Aransas Pass – another town ravaged by Harvey. There, lifelong Aransas Pass residents Kristi and Danny McElroy and their 10-year-old son are rebuilding their home the hurricane destroyed. The family stayed in a FEMA hotel for a couple of months. More recently, they’ve been living in a travel trailer down the road in a local RV camp. Danny retired from his job as a firefighter with the Aransas Pass Fire Department, so he could be close to his wife and son as they rebuilt. They say they are the lucky ones, and that a lot of people in Aransas Pass have left. But the McElroys are determined to stay, and are planning to move into their home fairly soon. “August 25, one year after the storm… that’s what we’re shooting for. Cause I wanna be back here and say haha I won. I’m still here and I won,” Kristi McElroy says. ”As long as we have electricity and air conditioning we’ll put a mattress on the floor. We’re gonna lay our heads in this house on Aug. 25,” Danny says. Hurricane Harvey was followed by a massive release of highly toxic chemicals in the coastal area. Ilan Levin, Texas Director of the Environmental Integrity Project, joins us to discuss how better to prepare for future disasters. Then, Texas Observer environment reporter Naveena Sadasivam (14:46) will talk about a nine-part series called "Shallow Watters," which looks at the impact of global warming on the Rio Grande River. School’s out in Texas, and it’s hot. That’s got many people heading for their nearest pool, or, if you’re more ambitious, the Gulf. But one of the state’s most beloved beach getaway destinations, Port Aransas, took almost a direct hit from Hurricane Harvey back in August, and the town’s still bouncing back.